You’ve booked, or are thinking about booking your module 2 (on-road) test and are looking for some final tips on how to pass the MOD 2 motorcycle test. Here we will offer those tips to help you try and avoid those common reasons for failing. You’re off to a good start though because pass rates for MOD 2 are quite high. From April 2017 through to March 2018, the MOD 2 national pass rate is 71.3%. Each individual test centre pass rate does of course vary, some much better than others. If you want to see your local test centre pass rate, see MOD 2 pass rates. It’s easy to misplace documents, so get them together at least two weeks before your MOD 2 test just in case you can’t find something and need to order a new one. The last thing you want is for your test to be cancelled on the day due to documents. Test appointment times are strict, so if you arrive late, the chances are your test will be cancelled – you’ll also lose your test fee and have to pay again to book. If you’re not too sure where your test centre is, check out the location before your test day and take into account traffic conditions around the time of your test. Aim to arrive a good 15 minutes before test commencement. If the examiner believes your eyesight isn’t good enough, your test will be cancelled. 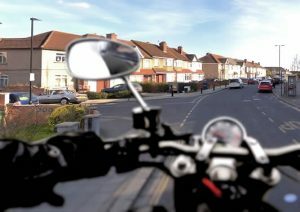 See motorcycle eyesight test for further information on how this is conducted. Ensure your motorcycle is taxed, insured, is roadworthy (tyres in good condition – see how to check motorcycle tyres) and has no engine warning lights on. Don’t forget you’ll need L plates on the front and rear of your bike (L or D plates in Wales. Now that we have the preliminaries out of the way, let’s take a look at the actual riding part that takes around 40 minutes or so and some of the most common ways that riders fail the MOD 2. Many tests are failed very soon after leaving the test centre. It’s at this point where nerves are at their highest and where a test candidates mind might not be as focused as it should. If you want to have a better chance of passing the MOD 2, then get to know your test centre. Look at how you exit the centre – is there a pavement to cross? Is it a busy road? What are the junctions like in and around the test centre? Look at and practice the roads and junctions directly around the test centre to gain familiarity – you’ll feel a lot more confident at the start of your test if you know what’s ahead. Junctions are the number one reason for failing motorcycle MOD 2 tests. Junctions include minor to major roads, major to minor, roundabouts, box junctions, crossroads etc. They come in all shapes, sizes and complexity, so how you approach them is essential. Approach speed is key so that the examiner can clearly see that you make use of the OSMPSL routine. Always try to assess the junction well before you get there rather than dealing with it on arrival and approach at a speed based on the type of junction – a blind junction would require a much slower approach than a wide and open junction for example. Observation is a common mistake at junctions, a mandatory lifesaver from a major to a minor for example. Along with observation and correctly performing the OSMPSL routine, good road positioning and not cutting corners is also what the examiner is looking for. Many of these faults tend to result from an incorrect use of speed. If you want to pass the MOD 2 motorcycle test, cancel those indicators. Forgetting to turn off indicators is a common fail and it’s surprisingly easy to do due to your focus being applying routines and reading the road ahead. Shoulder checks, lifesaver, call them what you want, but one essential lifesaver observation missed can easily spell a failure. A tick in the ‘observation’ box on the test report is a common fault. Another common fault is using the wrong lane. The MOD 2 test isn’t there to assess your navigational skills, it’s there to test your safety. So if you do find yourself in the wrong lane, either go where the lane tells you to go (even if it’s not where the examiner told you to go), or get back into the correct lane only if it’s safe and legal to do so. This situation happens frequently at roundabouts where the rider finds themselves in the wrong lane for the direction they intend on going. In this situation, it’s perfectly acceptable to go all the way round to take the correct exit – again only if it’s safe and legal to do so. 20 mph limits are becoming more commonplace in pedestrianised areas. Observation is essential as it can be easy to miss a sign or road marking. We’ve looked at common mistakes, now let’s run through a some tips for helping you pass the Module 2 bike test. All motorcycle test centres have what’s called test routes devised by the examiner with the intention to include as many diverse roads and traffic systems possible within 40 minutes. That makes sense as examiners clearly want to see if candidates are capable and safe given any situation. Many of these routes intentionally include known challenging and difficult sections. If you are familiar and have practiced these difficult sections, your chances of passing the MOD 2 are considerably increased. Find yourself an instructor who knows the routes well for the test centre of your choice. In theory, if you’re a good enough rider you should be able to safely and confidently deal with any type of road and condition. But in reality, some test centres are easier than others. Test centres located within a busy city will tend to have more complex systems and busier roads and as a result, they often have lower pass rates. If you consider traveling to a quieter locations for your test, you may increase your chances of passing the MOD 2 test. This is essentially where your instructor / trainer takes the role of an examiner and takes you for a mock riding test. The 40 minutes will be conducted as though it’s a real test and is a great way to introduce you to the real thing. The benefit is that you’ll know what to expect on the real test, you’ll be less nervous and you’ll have a better understanding on how well you deal with the stress of a test situation. Verbalise and express into words everything you’re going to do and everything you see. This includes potential hazards, signs, road markings, riding routines, what you see ahead, if it’s a junction, what type of junction, what position you need to take etc. This is called commentary driving / riding and is used by professional drivers. It may seem a little odd at first but it helps you to focus and to be much more alert to everything around you. Try it, it works wonders. If you’re a car driver, practice commentary driving when in your car too. The mistake may not be as serious as you think and only result in a minor. The examiner may not have noticed it. Yes examiners do miss things and sometimes that might work in your favour.